​1987 at Resthaven, Castalia, Ohio. North Carolina canvas covered decoys were sold at the 2016 ODCCA Saturday night auction. 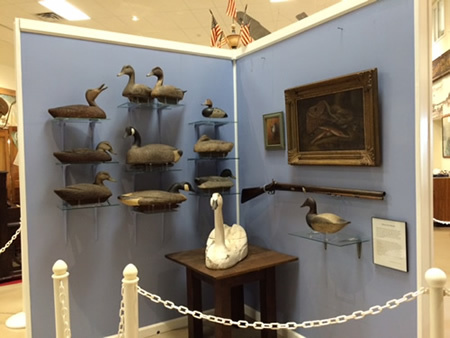 Nice examples of classic decoys from western Lake Erie were on display this summer as part of a special exhibit at the Lake Erie Island Historical Museum on South Bass Island. The auction begins at 6 p.m. in the ballroom and provides a great opportunity to add or subtract to your collection. Click here for more details. Last March Barb and I decided to exhibit at both the March O.D.C.C.A. (Strongsville) and G.L.D.A. (Westlake) decoy shows. We had a pleasant time and I bought and sold a number of decoys at both shows. The fact that we did somewhat better at both selling and buying at the Strongsville show surprised me a little, if only because the G.L.D.A. show, it must be said, attracts more dealers and collectors from the east coast, many of whom specialize in what are referred to as being "collector-grade" (expensive) decoys. More recently I've been wondering, and also discussing with other collectors and dealers, just why it is that the vintage decoy aspect of our show still is doing well. For the sake of dealers who are wondering if they should set up at Strongsville, and also for collectors in general, I’d like to share our thoughts with you. As always, your opinions are solicited and valued. A small part of this may have to do with the fact that the O.D.C.C.A. show comes first on the schedule; and also because we have a loyal following because we are the original Ohio show. [It should be pointed out that we consider the Erie, Pa. and S.E. Michigan areas to be 'close relatives', decoy-wise]. There is also less competition from other dealers. However the main appeal of our show, I believe, is that it offers a special kind of excitement due to it's multi-faceted nature, and also because much of it is held in one large exhibition hall with everyone joining in the fun. Carvers are the living link to the vintage decoys we collect, and we enjoy sharing the same roof with these people. The same can be said of the waterfowl and wildlife artists who exhibit at the show. Keep in mind also that this club has done its part in reviving and promoting the use of hand-carved wood decoys for actual hunting. As important as anything, we also encourage youngsters, who are included in special activities geared for them - often with surprising results. A number of nationally renowned artists and carvers got their start through the O.D.C.C.A. club. Supporting these kids should be important to all of us. The simple fact is that all kinds of people, from many different states and backgrounds, attend our shows. Many of them buy vintage decoys from time to time that catch their eye, even though they might not regard themselves as being true collectors. They usually can discern a quality decoy from the oft-encountered antique mall "clunker”; and moderate, fair prices won't scare them off. They like to learn about a decoy's history as well. Dealers and collectors who bring decoys in this category usually do well. And don't be afraid to bring some higher-priced decoys too. Sales in this range continue to improve. If you think you might like to set up in the ballroom, don't wait too long - we did sell out last year. First floor rooms are available, but there is a possibility they can sell out too. There's one more thing. If you are interested in vintage Ohio decoys, this continues to be a good show to check out. See you in March! It's important for collectors, whether they are experienced or new to the hobby, to know the history of notable decoy carvers. This knowledge provides the depth you need when you are about to purchase a decoy for your collection. And carvers can learn about the process that makes a decoy collectible. From our ODCCA archives, I have selected two biographies of men from Ohio whose decoys can still be found at shows, estate sales, antique shops and wherever your search may take you. Bill Enright of Toledo, Ohio, began making decoys commercially during the late 1930s and continued into the 1960s. Over the span of time he made more decoys for Ohio hunters than any other carver. Indeed, some of these are still in use from Sandusky Bay to the Michigan border – the area where his decoys have been especially popular. The species he carved were canvasback, redhead, bluebill, mallard, pintail, black duck, and goose. Adding to the variety is the fact that he made many variations of each. Content, low, medium, high and turned heads enhanced the luring quality of Enright's rigs. Bodies varied not only in form, but also in size. In addition he made specific models for certain areas such as Lake St. Clair and Mitchell's Bay. He preferred cork over wood to make his bodies, and he constantly experimented with paints and sealers to obtain the hardest surfaces possible to enhance durability. The graceful yet simple body forms he achieved still serve as timeless models for any hunter who would like to carve his own decoys. Vern Rider, the son of Jack Rider, inherited his father's love of the outdoors. He managed Jim's Place, a resort near his father's marsh outside of Sandusky, Ohio, for 25 years. Like his father, he spent most of his free time hunting and trapping. Fortunately for today's collectors, Vern also was a collector. He began saving decoys long before it became fashionable to do so. As a result, most of his father's production and that of many other early Ohio carvers was saved from the wood stove or a similar fire. Today, Vern's collection can still be viewed at the Magee Marsh Bird Center, Magee Marsh, Oak Harbor, Ohio. Also on view are decoys by Enright, Sharon, Rider, and Crooks. A visit to the center is worth the drive to view such a diverse and high-quality display of decoys. ​Despite recent stories in newspapers, magazines and even TV, to the contrary the collecting of old decoys need not be restricted to the wealthy. 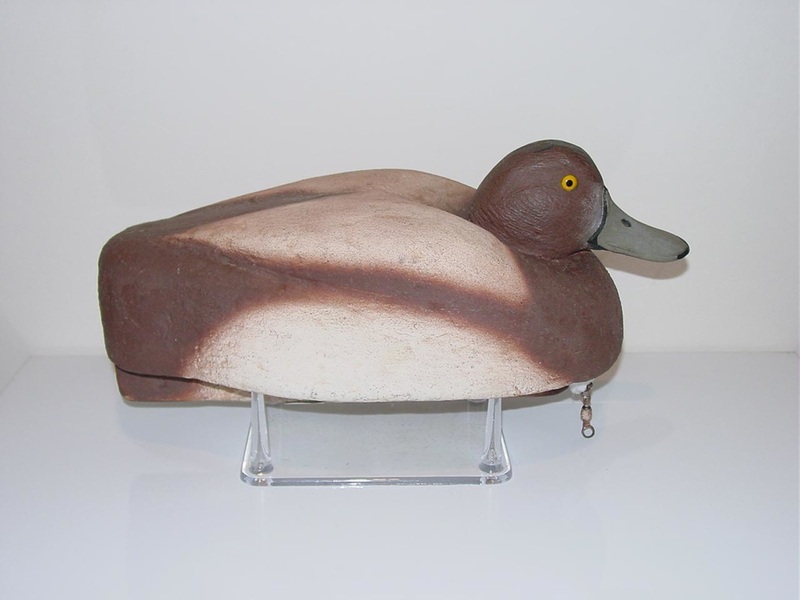 While some decoys do indeed fetch thousands and tens of thousands of dollars, many very worthy specimens are regularly sold in the fifty to several hundred dollar range. What explains the wide diversity in decoy prices? As in other art/antique fields the answers are not easy to come by and when they are forthcoming, they often don't make the best of sense. Fad and fashion often play an out-sized part in establishing values. East Coast decoys for example, tend to bring the most money because the early collector/authors lived there and were most familiar with decoys of the region. Their opinions established a decoy pecking order that even today still holds away in a large extent. With some exceptions, a decoy's paint work is usually placed well down the list of criterion by the experts. Carving excellence, overall form and historical significance are considered to be far more important. At point of sale, however the lack of original paint, even if it had been the paint-by-numbers variety, is often greatly penalized. If you can overlook the absence of some or even all the original paint, some superb carvings can be had at really modest prices. Rarity, when it comes to decoys, is often penalized. Common decoys like Masons are easily described, graded, pigeon-holed, and filed, accounting for the high interest and subsequent high prices of Masons. Obscure makers with limited output often escape the notice of collectors who must have the assurance of a famous "name" with their decoys. If you have good and sound instincts, some real bargains can be found in decoys with famous pedigrees. While much more can be said, the central location of our March show assures a wide range of decoys from which to choose. There are sure to be a number of "good buys" AT ALL PRICE LEVELS fresh to market. See you there!